Nokia's Nseries devices are arguably the best phones for video recording available on the market today. With most devices recording at 30 frames per-second and in VGA resolution, it's easy to understand why there are so many 'vloggers' with an Nseries phone. Unfortunately, none of Nokia's devices have ever really been able to get the detail required by many when trying to record something close-up... Until now. Read on for a rather primitive solution from Georgije of Symbian-Freak! To get macro video recording on your phone, just hit the back of it(or wherever the camera is) with moderate force! Hitting your device in this area should work. This only seems to work on Nokia devices with mechanical shutters. I've gotten very pleasing results with both the N73 and N95. Disclaimer: I'm not responsible for any damage caused to your device. Remember, these phones contain sensitive electronics which may cease to function if you're not careful! I hate you, I hate you, I hate you! I just bought (like it arrived yesterday), a digital camera for 162euros for THAT feature alone, to be able to record my phone's screen in video. And now you publish it?! Ever so sorry, Rita. If it's any consolation, I only discovered it today aswell! I tried it on my N95-1 and it doesnt' seem to pop into macro mode. 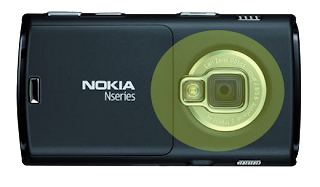 Could you draw up a rough diagram pointing to the exact location on where to nudge my N95's cam? Thank you. Amazing discovery bro. I've added a small picture to demonstrate where I've been hitting my N95. I have Nokia N95(01.01) V30.0.015 RM-159. I tried hitting the back of the phone but unable to enable the high resolution macro video. If you post a video of how and where to hit the phone will be great. I made a small tutorial. Did not realise i had to tap that area in general, previously i applied a very concentrated tap to the flash. Today after looking at your diagram i tapped that general area with my whole finger and voila, macro video! hmm.. does this work for all nokia phones? i tried with my 5800 and it doesnt change to "macro mode"
Oh my oh my, this actually works. Nice one.